At times the IRS radar can shift to focus on specific targets. Lately, we have notice a growth in a few areas that we wanted to share with our readers: (1) Misclassification of Employees; (2) S-Corp Reasonable Compensation; and (3) For Profit or Hobby Farming. Noncompliance in any of these three areas could lead to a painfully long and expensive audit. There was a short time where the topic of misclassification of employees escaped the forefront of many business owner’s minds. However, we have seen a new push to increase compliance and potential penalties for business owner’s that turn a blind eye to this topic. February 20 of this year, the IRS and Department of Labor (“DOL”) renewed and increased commitments to a joint initiative to crack down on misclassification of employees. Worker classification issues are the third most examined issue, and the top issue requiring adjustments. The adjustments total more than $44 billion a year. 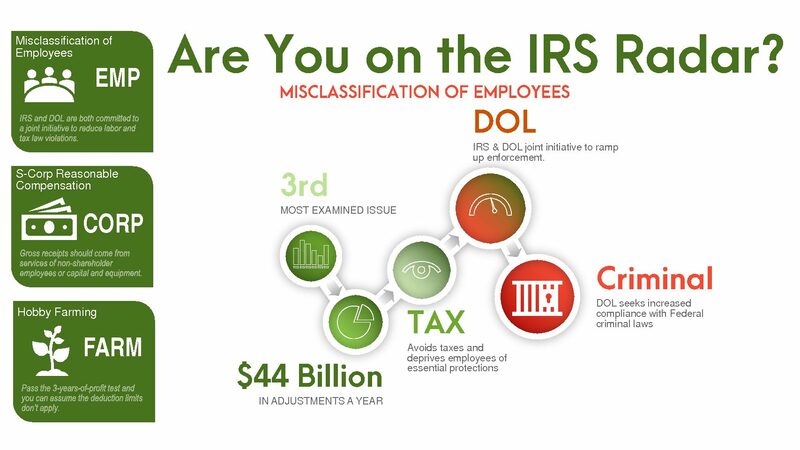 The IRS and DOL have pledged to work together to reduce misclassification of employees. Although misclassification of employees is not a violation of the law itself, it is often associated with labor and tax law violations. There are two sides of issues for the IRS and DOL. First, employers avoid paying Federal unemployment tax and portions of the Social Security and Medicare taxes. Employers also potentially avoid State unemployment taxes, worker’s compensation and disability insurance, and the withholding of State, local, and Federal income taxes. Second, misclassification deprives employees of the employer’s contribution to Social Security, Medicare, unemployment insurance, and worker’s compensation. Employees can also lose critical workplace protections – minimum wage, overtime, and unemployment payments. A final consideration on this matter – Do you qualify for a safe harbor provision? The simple answer is good luck. The big hurdle for most businesses is the first requirement. That requirement has a litany of factors that would be considered, which tends to lend itself to classification of these workers as employees. We consistently address the questions regarding the best tax structures for businesses, specifically for single member entities or practitioners. Although the subject of reasonable compensation has dropped off of the minds of the businesses, this is another area the IRS is committed to finding abuse of the system to minimize tax impact through distributions. Reduced to simplicity, the question becomes how much compensation should I pay myself? Form 1120S states, “Distributions and other payments by an S corporation to a corporate officer must be treated as wages to the extent the amounts are reasonable compensation for services rendered to the corporation.” Therefore, to add to the vague level of guidance the IRS uses a series of factors to determine reasonable compensation. First, the IRS looks at the source of the S-corp’s gross receipts: (1) services of a shareholder; (2) services of non-shareholder employees; or (3) capital and equipment. In the IRS’s view, if the gross receipts and profits primarily come from items b and c, it is reasonable that the shareholder would receive distributions along with compensation. However, if the gross receipts and profits come from item a, the majority of the profit distribution should be allocated as compensation. Next, the IRS can also consider several other factors including: training and experience, duties and responsibilities, dividend history, payments to non-shareholder employees, comparable business payments for similar services, and the use of a formula to determine compensation. Based on the above, you might find it useful to research the Bureau of Labor Statistics and its wage data by area and occupation. Then, use the data as a starting point to know what the applicable market is paying other shareholder-employees like yourself. The third source of attempting to avoid taxes and draw the eye of the IRS is hobby farming. IRS PUB 225 attempts to help property owners understand the limitations of deducting expenses for farming. Lately, many people are looking to move away cities to enjoy the benefits of small farm life, including some potentially large tax deductions. However, if you are attempting to claim you are operating a for-profit farm to avoid taxes, the IRS is watching closely to reclassify your endeavors as hobby farming. Profit is gross income that is more than the deductions for it. An option from the IRS can help you get going without worrying about having to prove up the factors within the first 5 years of operation. You can use the presumption of profit later, postponing any determination of for-profit or hobby farming until the 5 years have passed. You must file Form 5213 within 3 years of starting your activity. However, if the IRS sends written notice to you disallowing the deductions you reported, you have 60 days after that notice to file Form 5213. The IRS doesn’t typically wait 5 years to send that notice. If you haven’t filed Form 5213, we are finding that on 2 or 3 years of deductions for farming, usually larger deductions, the IRS is sending you a letter. There are some basic advantages and disadvantages of using the presumption of profit later by utilizing Form 5213 to extend the determinations of profit for the full 5 years. First, let’s look at the advantages. The IRS will not immediately question the for-profit determination of your activity. Also, the IRS won’t limit your deductions. The disadvantages can prove to be daunting for some. If you fail to pass the 3-years-of-profit test or prove otherwise using that long list of factors above, the IRS will retroactively apply the deduction limit to all years in the 5-year period showing a loss. Moreover, filing the Form 5213 automatically extends the period of limitations to 2 years after the due date of the last year’s return. Thus, you will be flying blind for 2 years until the IRS sends written notice of a hobby farming deduction limitation. We have an experienced board certified tax law attorney* to help you through these issues. If you need help with a legal tax issue, call us at 877-622-5840 and schedule an appointment with a board certified tax law attorney*. * Steven A. Grenier is certified by the Louisiana Board of Legal Specialization as a specialist in Tax Law and Estate Planning and Administration.